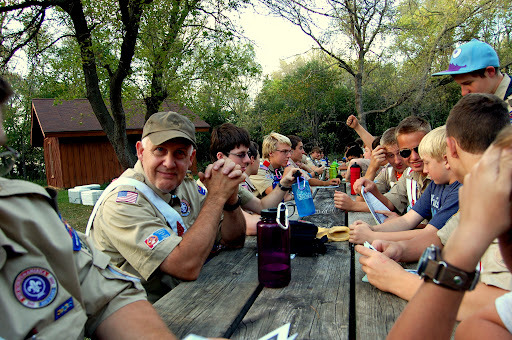 This weekend, The Patient Wife and I were invited to the ‘Hoda cabin and heck was sure raised. There’s an extra manly factor to cooking in a Dutch oven for a host AND their family, so I whipped up this little gem for Sunday morning breakfast. It was a hit with the 4-year-old and Mr ‘Hoda and I had seconds and thirds. 3 or 4 full pieces of bread. Mix the eggs, vanilla, cinnamon, and milk together. Do it with a lot of heart because we’ll know if you don’t. 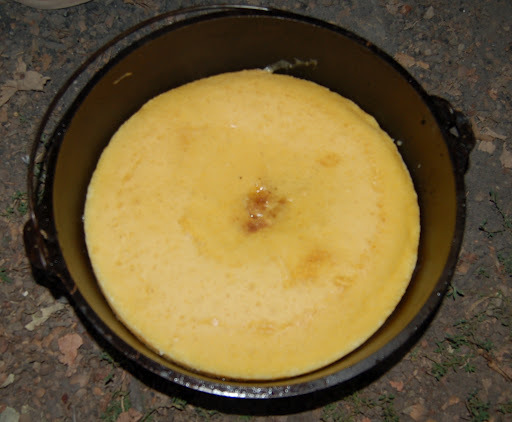 Melt the butter in the bottom of the dutch oven, and then dissolve the brown sugar in it. It’s really not that hard. Stir it with a wooden spoon or something. 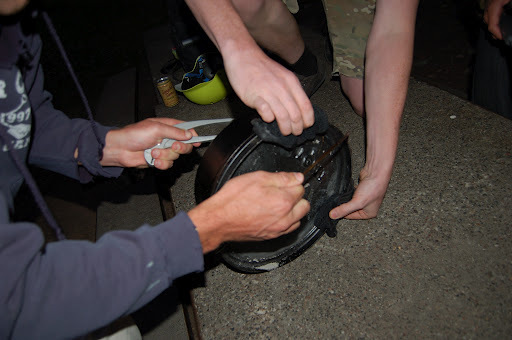 Don’t use metal, as you’ll damage the protective coating on your dutch oven. Now that the butter has melted, cover the bottom with a single layer of pecans. Soak each piece of bread in the egg solution and put it in the oven. 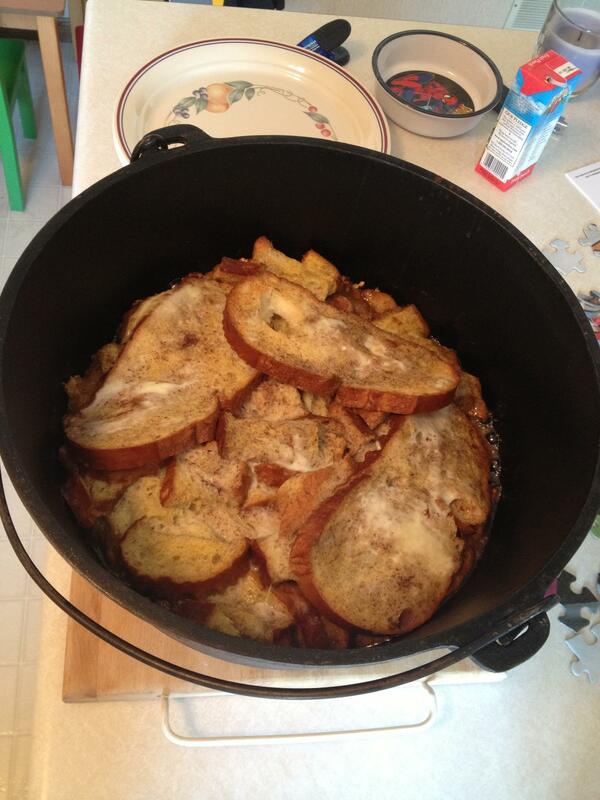 Once all the bread is in there, soak the three or four whole pieces in what remains and place them on top. Dump any remaining egg solution over the top. Either bake at 350 for 30-45 minutes, or put 8 charcoals underneath and 12 on top. You don’t even need to serve it with anything. It’s seriously that awesome. You would seriously have to be a moron to screw this up. It’s so simple. Leave me your favorite meal to cook for company and I just might cook it and post about it. In which El Chris makes a turd of himself taking too many pictures of food. This weekend, I went camping. More on that later. 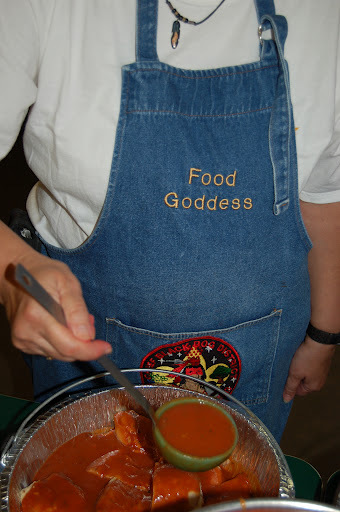 Naturally, I had my camera and I made certain that all the cooking staff KNEW that I would be following them. All four of the meals were made in dutch ovens, and they were so good that my face melted straight off. 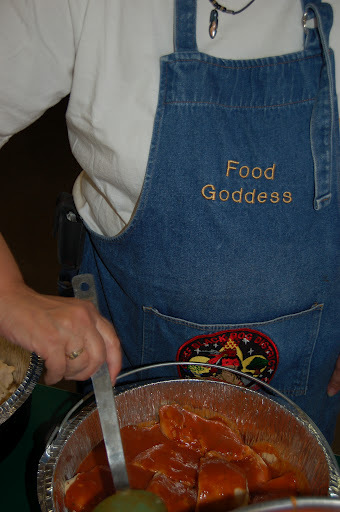 The Food God and Goddess were there (you’ll know her by her apron) and spearheaded some sweet meals, including mountain man breakfast and a killer set of dutch oven sloppy joes. However, those couldn’t hold a candle to the chicken parmesan they served for dinner. It was like Heaven landed on my tongue and then exploded. It was like a thousand Golden Retriever puppies were giggling inside my mouth. 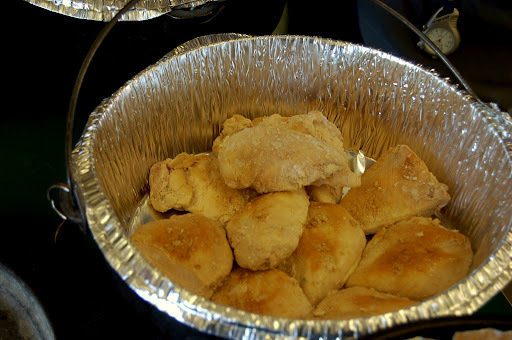 And it followed a VERY simple recipe that can be scaled to serve over 100 people, which is what we did. 1 package instant mashed potatoes. 1. 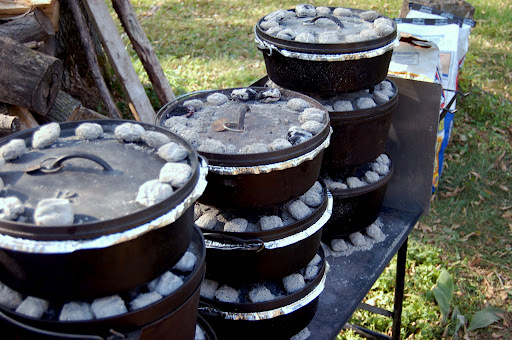 Line up your dutch ovens. If you have one, I guess that’s fine. The liners placed in each oven made cleanup a snap, so get a bunch right now because I said so. Make sure you have 1 additional pot liner, as we will need the extra later. 2. Heat the dutch oven to 350. For a 12″ oven, that means you’ll need 24 charcoal briquettes total. Since we’ll be roasting the chicken, put 12 briquettes underneath, and 12 on the lid. 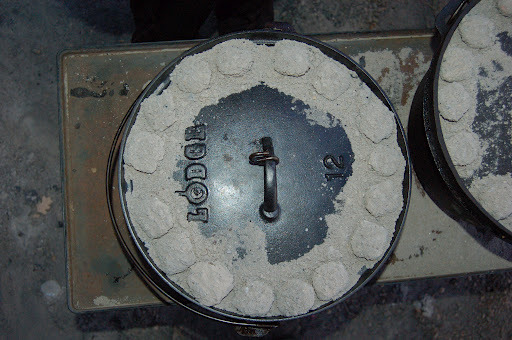 Make sure you arrange the coals on the edge of the lid and not in the middle. 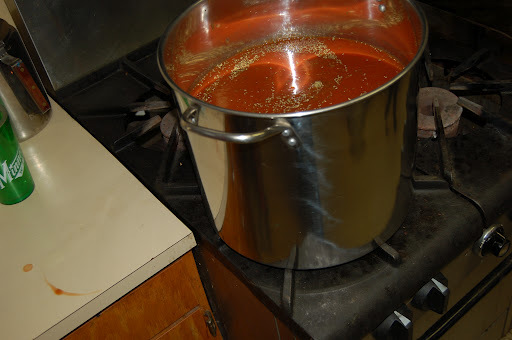 This will ensure that the lid heats evenly. Just trust me. Do it this way or you’ll screw it up and probably die or something. Careful, they’re hot and if you touch one then you’re stupid. 3. Roast the chicken for 20 minutes. 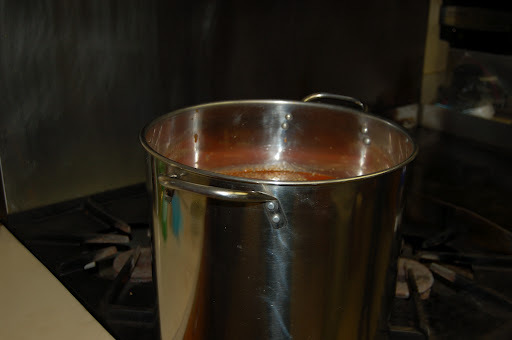 By roast I mean put the lid (with coals) on the pot and go drink some Shasta. It better be Shasta. 4. 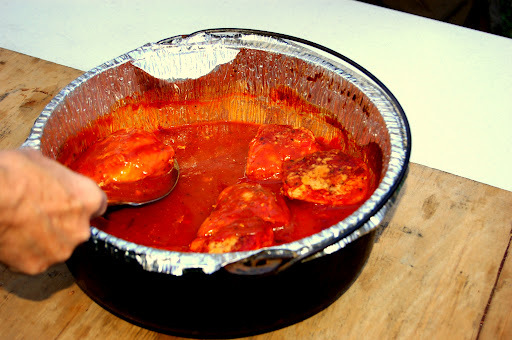 While the chicken is cooking, you’re going to prep the pasta sauce. BECAUSE I SAID SO! GOD! In a seperate pot, stir all the ingredients together. That means you take the oregano, 2 cans of tomato junk, corn starch, and parmasan and stir them all together. I don’t care how you do it, as long as you stir the bejeepers out of it. Cook over medium heat or so the sauce is hot to the touch but not bubbling. It will thicken, like your hipster buddy’s love for crappy music. Here’s a 4th picture of the pot with the same stuff. 6. Now we start the real prep. The cooked chicken is now in the dutch ovens. That’s a hard win, folks. At this point, you should have a guy named Brandon you can yell at. Do it. “GO OPEN THE CORN!” you can scream. 7. 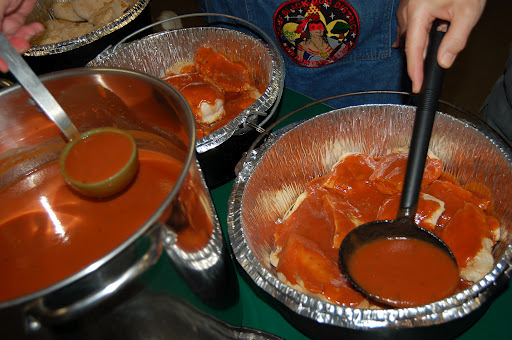 While Brandon is opening corn, you can spoon the delicious sauce over the chicken. You can do it like we did below, as long as you’re generous. 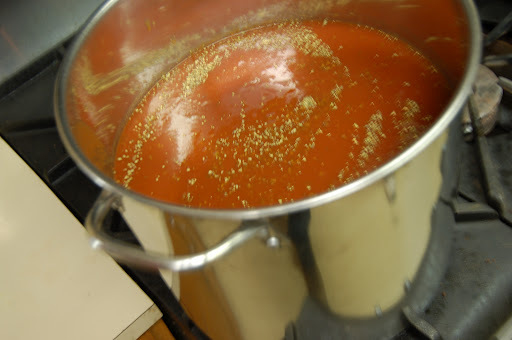 You will have sauce left over, which is perfect for bread dipping. and we waited impatiently to see her reaction. fit for consumption. There was much rejoicing. 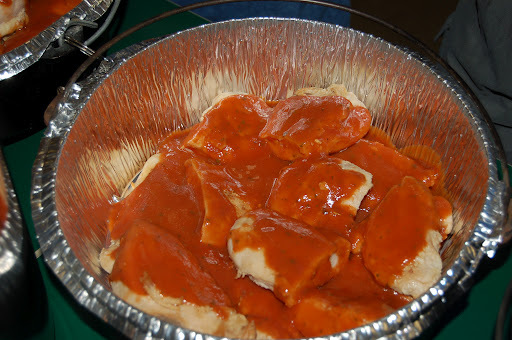 Then we poured much sauce onto much chicken. 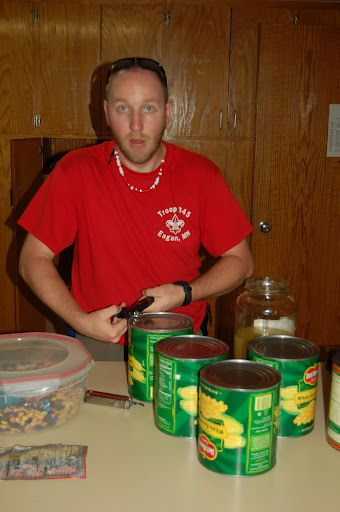 In which El Chris watches Brandon make so much corn that El Chris will poop corn for a week. 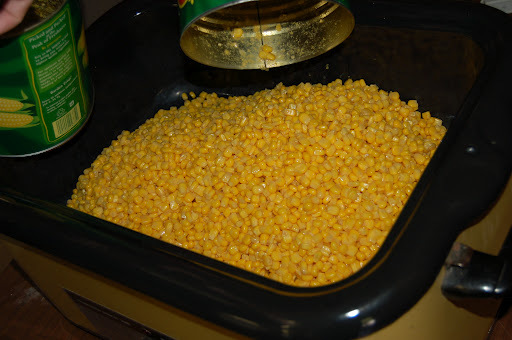 You can now have Brandon heat the corn and dump it into a heaty thingy. 8. With the corn, as long as it’s been heated, you can serve it up. I like to heat it in the can (the can WILL take the heat from the stove, as long as you ditch the label so it can’t burn.) and then serve it from the can. It saves on dishes, but the electric heaty thingy was way handy. 9. While the corn and chicken are doing their thing, make the package of mashed potatoes. Mince and add the leftover garlic. Mix in some corn. 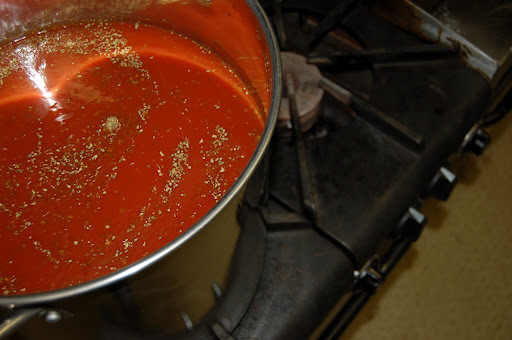 Cover with surplus sauce while serving. 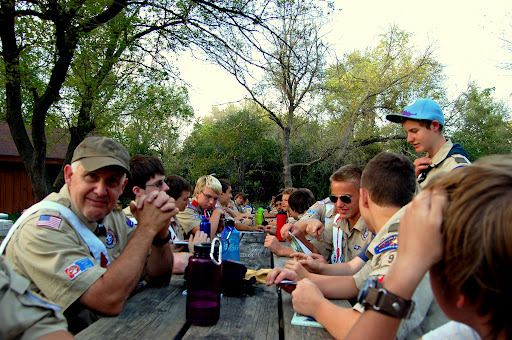 Make new friends. 10. At this point, all of the chicken should be in ovens, ready to rock. 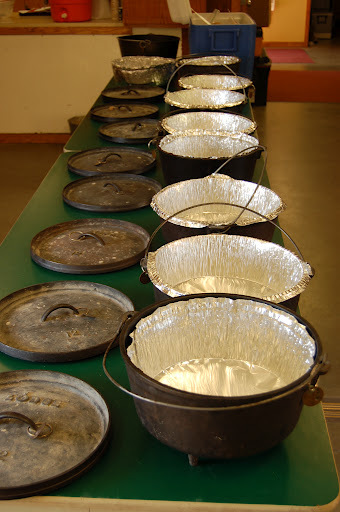 Since they’re all in 12″ dutch ovens, cooking them should be a simple matter of counting. Twelve coals on the bottom, twelve on the top. Stack. 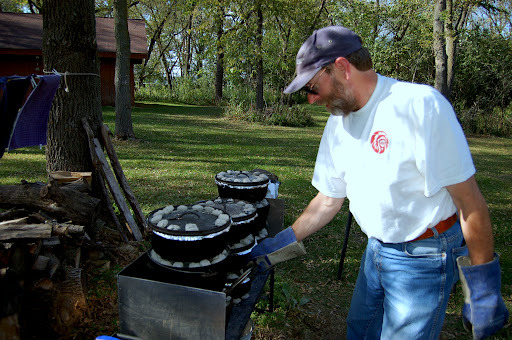 The top coals on the first dutch oven become the bottom coals of the next. Brilliant, right? Now stacky stacky (no more the 4 high, you’re not superman.) and cook for another 30-40 minutes. While this is cooking, slice the baguettes into manageable pieces. The bread should be used to sop up extra sauce. coals on the top and twelve on the bottom will be just fine, sir, just fine. Sometimes, make sure the Food God pokes at them to keep them cooking. He likes to poke stuff that’s burning. 11. About ten minutes before the chicken is done cooking, you can start making the pasta. To cook pasta, you boil it in water for 8-12 minutes. Put some in your mouth. Does it feel right? Then it’s done. 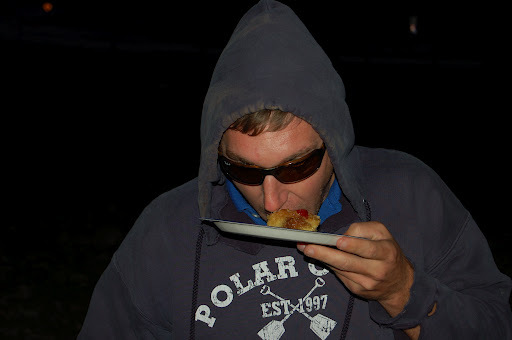 You can also taste (right, like put the food in your mouth and evaluate the results) the sauce and see if you like it. You can add a clove of minced garlic if you don’t like it and your wife says it’s ok, otherwise leave it be. At this point, you will have a table full of ordeal candidates who demand food NOW. They will soon be appeased. Paul was so hungry that he made eye contact with the photographer. 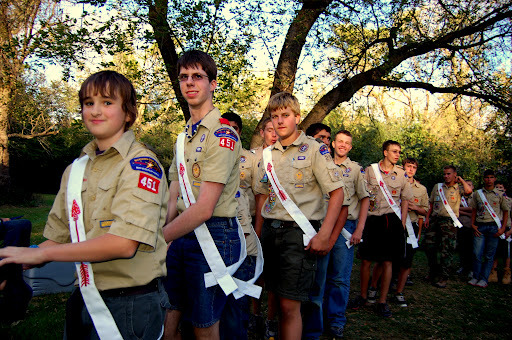 This is what all of the fellas signed up for. They have been waiting for this for EVER. It’s totally worth it. Make sure you douse their potatoes in sauce and give them bread to sop up the extra. 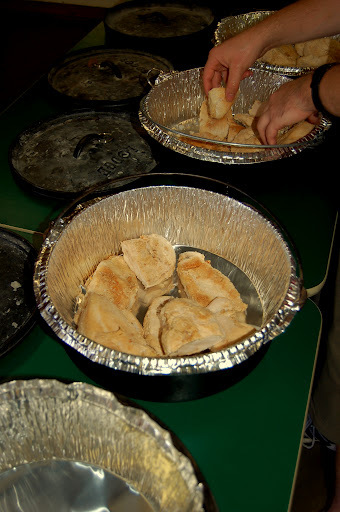 Each oven will supply 8-10 half-breasts-of-chicken. Got any other suggestions? I’d love to hear them! Leave them in the comments, a response is guaranteed. The super easiest pineapple cake you’ll ever eat ever. I have a recipe that I’m going to share with you. I decided that you are going to make it tonight. You’re going to make it and you’re going to love it. 1. 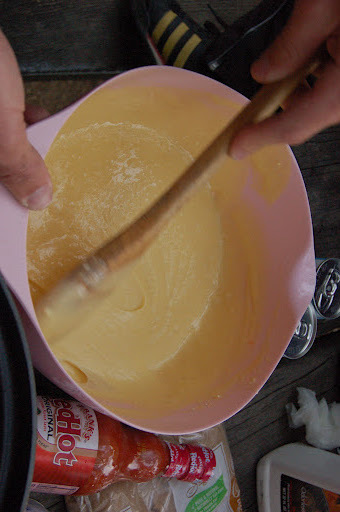 Make the cake mix by mixing the eggs, oil, pineapple juice, water, and cake mix together. If it’s not yellow cake then you’re doing it wrong. It’ll say yellow cake on the box. Seriously. You can’t screw that up unless you really really try. Here’s a picture of what it looks like in case you’re really stupid. See how mixy it all is? Make it mixy or terrible things will happen to kittens. 2. 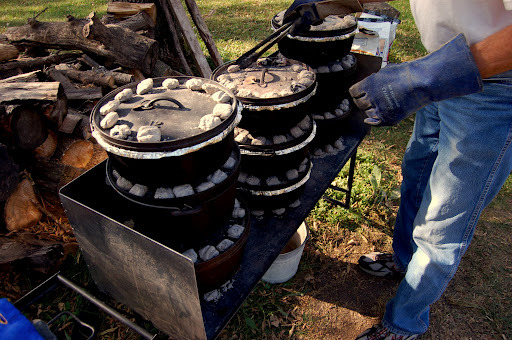 Heat the dutch oven over 12 lit charcoal briquettes. Like super hot. Melt the butter in the bottom. 3. Once the butter is all liquid, sprinkle the brown sugar over it. It’s super hard to screw up, so don’t screw it up. 4. 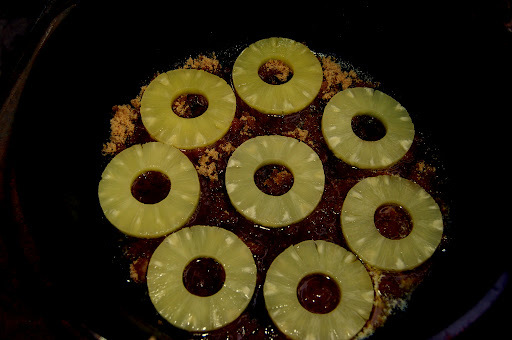 Now that the bottom of the pan is prepared, you should cover it with a single layer of pineapple rings. In each ring, you should put a maraschino cherry. Make it pretty, because it’ll come back later. See that? It’s pretty. Super pretty. If yours isn’t pretty then you’ll probably die. 5. 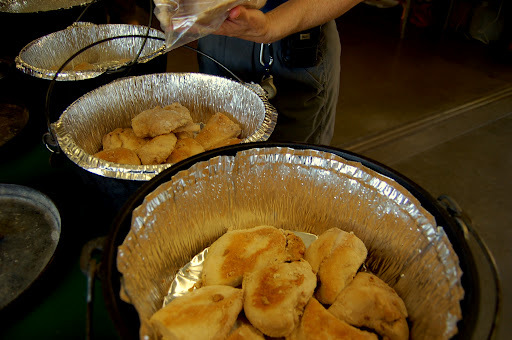 To bake, leave the oven over the 12 briquettes of charcoal and place 16 on the top. Make sure to put them up against the edge of the lid as I done did below. Rotate the oven counterclockwise and the lid clockwise 90 degrees every 15 minutes. Repeat for 45 minutes. Placing the coals around the edge is crucial. 6. After 45 minutes, pull the lid off, being careful not to spill the charcoal powder into the cake. It’ll look like my picture below and it’ll smell better than a kitten or something. Test it by poking it with a stick or fork or something. If it’s done, whatever you poked it with should come out clean. 7. 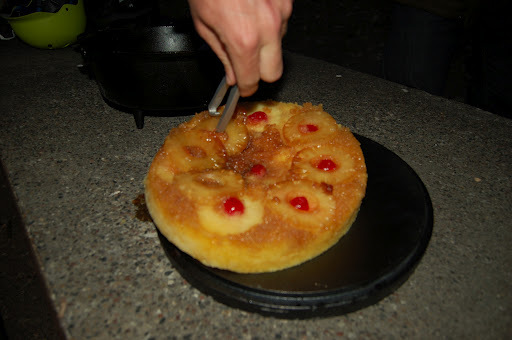 Stick a spatula between the cake and the pan to separate them. 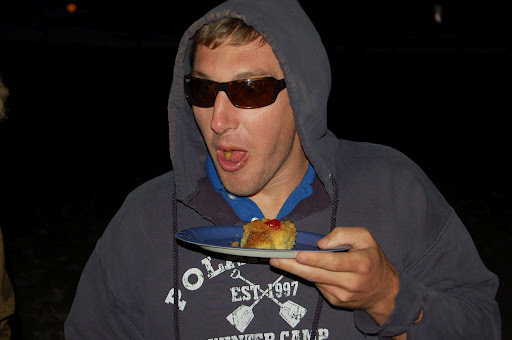 Turn the whole thing upside-down and get the cake on the lid. It should look nice and caramelly. Flipping it over is super complicated so make sure there are two of you and one of you stands on the table. See how chewy and heavenly that looks? Because it is. 8. Give some to your boss. Tell him he has to eat it without using his hands. He’ll be surprised when it’s good. 9. Serve with some ice cream. Or don’t. I don’t care, I’m not your dad.